Are you think of starting your own farm business? One of the most important elements, alongside the right land, is having the right agricultural buildings. Whether you’re looking to build from scratch or renovate existing structures, it’s vital that your farm is supported by the right agricultural buildings. These spaces will help house your essential equipment, as well as protect your crops and livestock. From barns and silos to greenhouses and cattle sheds, we’ll provide more information about agricultural building prices. Simply scroll to the section that you want to find out more about, or read the whole article for a complete overview. We’re working with steel building suppliers, so if you’re looking to compare prices for this type of structure, just go to the top of the page and fill in the form. If you’re looking for agricultural buildings for your farm, one of the first questions you’ll want answered is: how much is it going to cost? We’re going to dive straight in by providing some examples of prices for farm buildings, then explaining factors that can influence these prices. Temporary portable building Prices increase in length – starting around £2,000 for 6 m, ranging through to around £7,000 for structures measuring 24 m+. Storage tent For a 5 x 8 m tent it’s about £800. Alternatively, a 6 x 6 m tent is around £1,200, and a bigger option of 9 x 12 m is around £5,000. Wooden shed 3.6 x 6 m is between £3,000-£4,000. Steel buildings £500-£2,000 for kit garages and sheds; custom builds are higher. Extras Roller shutter doors – £300; window – £60 approximately. If you want to learn more about steel buildings, head over to our steel building prices page to find out more information about, and the costs of, this type of building specifically. Which factors can affect prices? If you want to construct the building yourself, then it’s best to find agricultural shed kits. With this option, you usually buy the materials and parts as a package and construct it yourself. The alternative is to use a specialist contractor or supplier to create a custom built structure for you, whether that’s cattle sheds, farm sheds, or agricultural sheds in general. Materials – is a timber, plastic, or steel structure more suitable for your requirements? Management – do you need a project manager to organise the build, or can you oversee the works yourself? Purpose – is the building for storage, housing livestock, or something else? Budget – how much can you afford to spend on the buildings? Maintenance – how much does it require and how frequently? Payment – is full payment required upfront? If not, can you pay monthly or with a payment plan? How big a deposit is required? Transport – can the buildings or kit be delivered, or do you have to collect the parts yourself? Viewings – is it possible to see a demo or model structure before you buy? Security – how can the structure be secured? For example, does it have lockable doors? BS5502 is a British Standard that agriculture buildings should meet. It’s a voluntary standard, although it offers guidelines for best practice on building safe structures that meet design and durability requirements too. 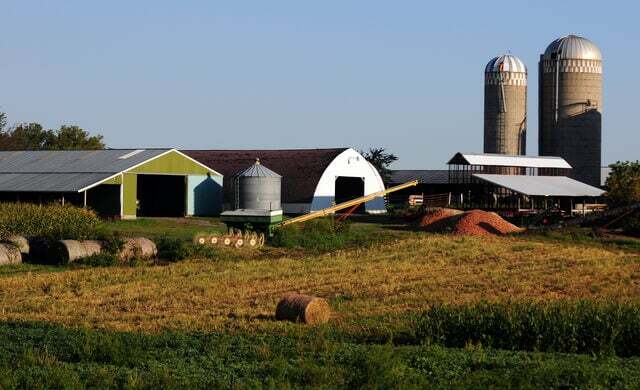 For more information on building standards and other requirements for agricultural buildings, check out the Rural and Industrial Design and Building Association (RIDBA) site. As part of the building process, you may need to apply for planning permission from the relevant department in your council or local authority. There are different circumstances that may or may not require it – you can read more about them on the Gov.uk pages about planning permission for farms. There are a few points to consider when going through the building process. We’ll outline some of the key steps you should take if you need to apply for planning permission. Note that planning permission fees vary across the UK – for example, England and Wales have different fee structures. In England, fees are set by the government nationally. Fees are often based upon the area of the building, and so are likely to increase the larger the structure. For example, in 2018, the fee for erecting buildings for agricultural use on agricultural land with a gross floor space of 465 square metres (sq m) or less was £96. For proposed developments with a gross floor space of 465 sqm – 540 sq m is £462. Gross floor spaces that are bigger than this have additional fees. You can read more about ownership certificates and agricultural land declarations on the Gov.uk guidance page. Additional documents may also need to be supplied, depending on your area. These are likely to be plans, or research that takes into account local concerns. Check with your local planning office for more advice. What is agricultural permitted development? These are a set of rights that apply to certain agricultural buildings, making them exempt from planning permission requirements. The legislation which governs this is called The Town and Country Planning (General Permitted Development) (England) Order 2015. If your farmland is five hectares in size (or bigger), then these rights may be applicable. Additional criteria also applies – the government offers further guidance on their permitted development page. You may still need to meet certain requirements or inform the relevant authority before works take place, so be sure to check first. At this point, you’ve learned more about the different types of agricultural buildings and the costs involved, as well as what may be included in the building process. But what about if you already have some agricultural buildings on your land? Or if you want to expand these buildings further down the line? In this section, we’ll provide more details about these stages. Why might agricultural buildings need to be replaced or expanded? Read more about expanding and diversifying your farm’s offering in our guide on how to start a farm business. If your property is listed or is a historic building (such as those with a thatched roof), additional conditions may apply or specialist construction may be necessary. How long an agricultural building will last for depends on the building standards class that it was designed to. These classifications are dependent on the size of the structure, as well as work time spent in the structure and distance to a road or house. These are outlined in the British Standard BS5502, which explains the standards that agricultural buildings should be built to – see above for more information. By reading this article, you’ve learned more about agricultural building prices, including the different types of structures available and their corresponding costs. We’ve also looked at the building process, as well as how to replace or expand agricultural buildings too. Next, for more information, read our page on steel building prices. Or, if you’re ready to compare quotes for steel buildings now, simply complete the form at the top of the page – it’s easy, free, and quick.